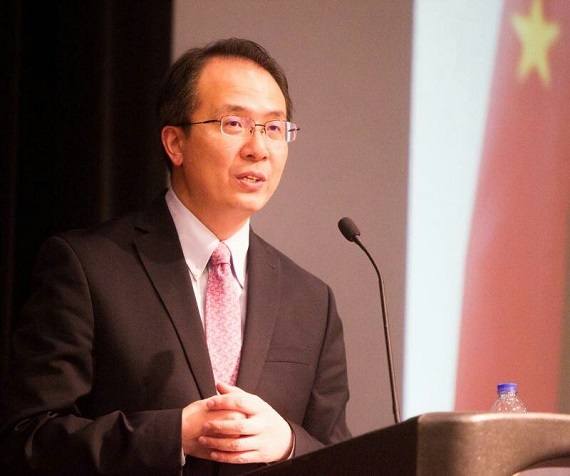 On May 2, 2018, Consul General Hong Lei made a keynote speech at the University of Iowa on China’s developments and the China-US relations in the new era. Mr. Downing Thomas, Associate Provost of the University of Iowa and more than 300 faculty members and students attended the event. Consul General Hong Lei said that after 40 years since the reform and opening up, China has become the world’s second-largest economy and the largest industrial nation. China’s contribution to the world economy has exceeded 30%, becoming the main stabilizer and engine for world economic growth. On the global stage, China has always promoted the noble cause of peace and development of mankind. The 19th National Congress of the Communist Party of China made important judgment that socialism with Chinese characteristics has entered a new era. After a comprehensive analysis of the international and domestic situations and China’s development conditions, the Chinese Communist Party has proposed a two-stage plan of making China a great modern socialist country that is strong, prosperous, democratic, culturally advanced, harmonious and beautiful by the middle of this century. Consul General Hong Lei said that reform and opening up is the key to China’s continuous development. President Xi Jinping announced at the Boao Forum for Asia Annual Conference 2018 that China will undertake significant measures to expand market access, improve investment environment, strengthen intellectual property protection, increase imports, open the country wider to the outside world. We believe that a more open and prosperous China will bring more certainty to today’s world that is full of uncertainties and instability, providing stronger support for world peace, development, and stability. Consul General Hong Lei said that next year marks the 40th anniversary of the establishment of diplomatic relations between China and the United States. Since the establishment of diplomatic relations, Sino-US relations have achieved historic progress and become the most important bilateral relationship in today’s world. The economic and trade ties between China and the United States are highly complementary. The two countries have formed a highly interdependent economic relationship. The continuous deepening of people-to-people exchanges and cooperation between China and the United States has enhanced mutual understanding between the two peoples. On major international and regional affairs, China and the United States have maintained effective coordination. The common interests of China and the United States far exceed their differences. Cooperation between the two countries is conducive to global stability and prosperity, and also in line with the expectations of Chinese and American people as well as the international community. Consul General Hong Lei stated that the development of China in the next 30 years will provide enormous opportunities for the United States. China will strive to develop Sino-US relations, bringing tangible benefits to the peoples of both nations. Currently, China-US relations have reached a critical moment. Both sides should learn from the historical experience of Sino-US relations so as to ensure the continuous, healthy and stable development of bilateral relations. We maintain that China and the United States must adhere to the correct path of strategic partnership rather than rivalry. The two nations must adhere to the right direction of enhancing mutual trust rather than mutual suspicion. And the two nations must coexist based on mutual respect and accommodating each other’s major concerns. We must adhere to the principle of expanding common interests through mutually beneficial cooperation rather than resorting to unilateral protectionism. 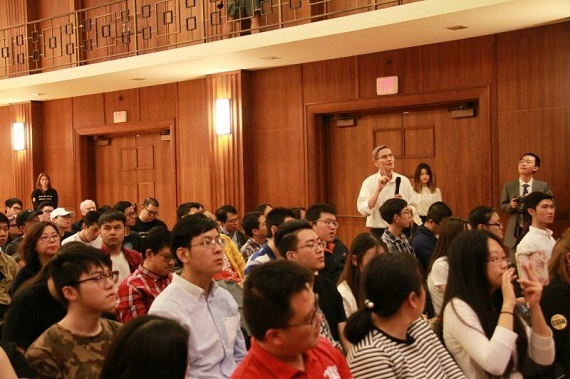 After the speech, Consul General Hong Lei also answered questions from faculty members and students on Sino-US trade relations, educational exchanges, the Belt and Road Initiative, and how the Chinese students in the United States can serve their country. Consul General Hong Lei’s speech and answers were well received by the audience.